New tariffs on imported steel and aluminium are set to take effect on March 23. The law includes exemptions for Canada and Mexico. Steel stocks were getting smoked on Friday. Steel stocks are getting smoked Friday after it was revealed Trump’s new tariffs on imported metals will include exemptions for Canada and Mexico. US Steel was down 3.2% at $US42.92 Friday afternoon. 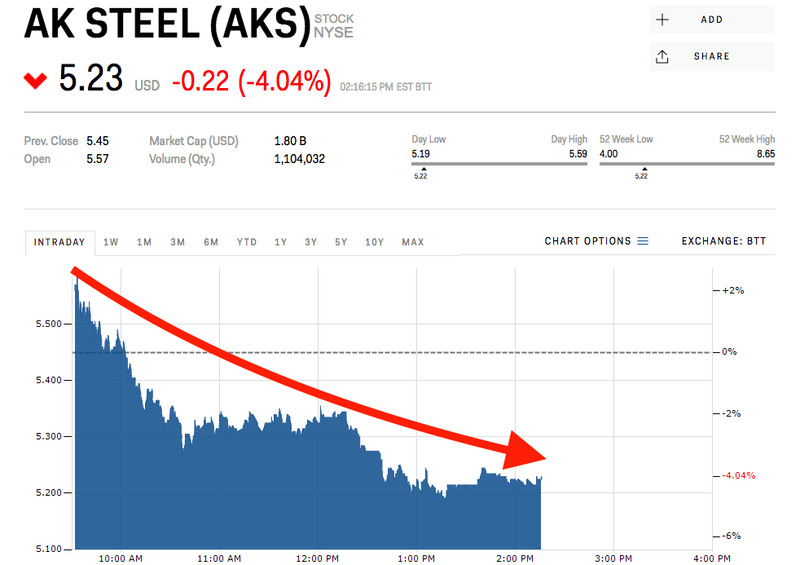 AK Steel was down 4.4% at $US5.21 at the time of writing. Canada is the biggest source of US steel imports, while Mexico is in the top five, meaning a significant share of imports will be exempt from the tariffs. Other countries will also be allowed to apply for exemptions to the new taxes of 25% on imported steel and 10% on imported aluminium. Metals producers have had a wild ride since the tariffs were first discussed over a week ago. Despite the losses today,Wall Street seems to be enamoured with metal company stocks following the tariff announcement, with several upgrades on US Steel coming after the company announced it would restart a plant thanks to the tariffs. “In our view, this restart is a strategic move and makes sense regardless of 232 impact, as payback should be rapid and X is already short on volume,” Credit Suisse analyst Curt Woolworth said Wednesday. Steel imports will be hit with a 25% tariff and aluminium imports with a 10% tariff. The measure will kick in 15 days from Thursday, on March 23. Canada and Mexico will be exempt indefinitely. Both countries had warned of retaliatory measures if they were not exempt. So far, the Trump administration has loosely tied the exemptions to negotiations over the North American Free Trade Agreement and said a failure to renegotiate it could end the special treatment. Other countries that present an alternative way to address the US national-security threat of their exports may be exempt as well.